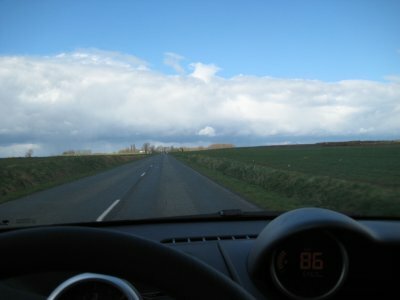 Driving with Henri through the French countryside. We had just come over a small rise when we spotted another one. A small rise is really the only kind of rise that one can come over in this area, as the land is mostly flat and waterlogged, given how close it is to sea level. They don't call it the low countries for nothing, though technically this being France I am not sure they call it the low countries. 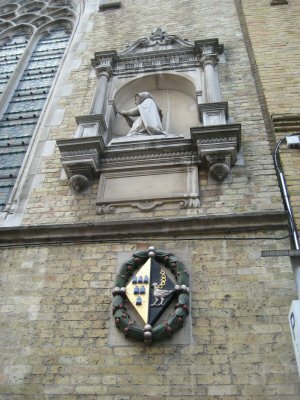 Back in the day, though, when everyone here was chattering at each other in Dutch rather than French, before Louis the XIV brought the region once and for all under French rule, they called the whole area of Flanders the low countries, comprising parts of modern day Netherlands, Belgium and France. Besides, without border control anymore, it is sometimes hard to know what country you are even in. I know I am somewhere close to the France-Belgium border, but which side of it I am on is anyone's guess. "If only you had a GPS, Henri," I said. He didn't respond, he just kept humming. Anyway, we had come over the rise, and there it was sticking out above the green and brown farm fields, one of close to a million I had seen that day. Another church steeple. 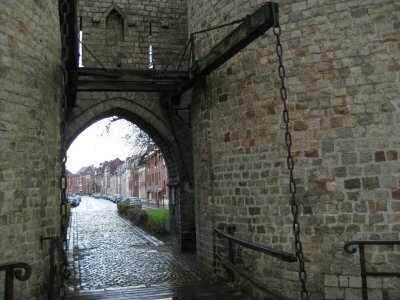 The whole area around Lille seems to be the same background over and over, kind of like I am driving with Fred and Barney through Bedrock, and they keep passing the same 5 cartoon houses. The view here is much prettier than stone-age Bedrock, though. 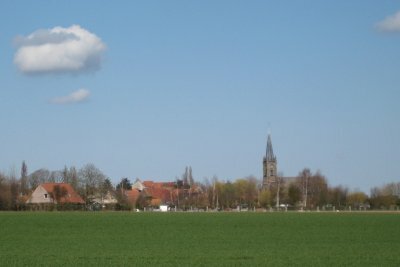 A green field, a stand of trees, a brown field, a green field, a cemetery, a small town with a pub, a few houses and a church with a steeple. Pass and repeat. The whole purpose of my trip to Lille was to leave it. 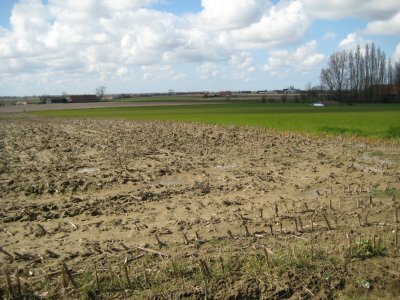 I came down to this area of France to see a number of WWI memorials, battlefields and cemeteries, and so I spent two days criss-crossing the French and Belgian countryside, with Virgin Radio playing on the radio. Virgin Radio – is there anywhere you can go in the world that Sir Richard hasn’t branded already? That weekend I got up early on Sunday to watch the opening race of the Formula One season, and there he was in Australia milling around the paddock at the F1 race this weekend. Somehow he ended up with his brand splashed on the winning car. Regardless of the incessant branding, though, the radio station played a decent selection of tunes, though I heard that James Morrison song Broken Strings featuring Nelly Furtado about 4 times an hour. So, it was just me, Virgin Radio and Henri, dashing around the French countryside. Oh, how rude. I haven't introduced you yet to Henri. Henri Renault, my readers. Readers, this is Henri. Henri is a Renault Twingo. I tell you it is a Twingo, because to my eye it looked like every other Renault on the road, all of which had different names. Henri was a very good companion and acquitted himself admirably all weekend long. France is the 5th country I have ever driven in. Apparently France and I have something with multiples of 5, for France was also the 10th country that I had every visited back in 2005. It was also the 3rd country I worked in, but that isn't a multiple of 5, so we shall ignore it. On the Saturday morning I was headed south towards Vimy along A1 when I saw a police car. A few seconds later, a white panel van shot past me. A few seconds after that, the police car whizzed past me with lights on. I caught up to the cop car and the panel van driving along the road, and realized that it wasn't a police car at all, but rather was a customs car. 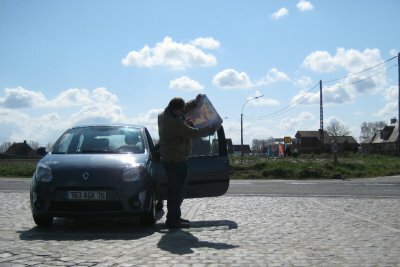 The car had a big lighted sign board on top that kept repeating "DOUANE SUIVEZ NOUS" - Customs Follow Us. At that point I realized that the panel van was from Belgium. I guess open borders don't necessarily mean free flow all the time. The morning was spent wandering around the Canadian War Memorial at Vimy Ridge. It was very moving, but I will speak about the experience there and at the other WWI sites I visited in my next entry, so for now let us pick up the story back on the road, this time as I pull into Thélus. 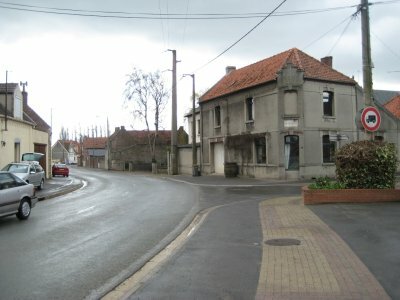 Thélus is a town just south Vimy, and it seemed to be mostly shut up and closed down for the day. I was starving, however, having not had breakfast and with the sun now past its apex and now on its way down towards the west, eventually to set. I found an open tabac. 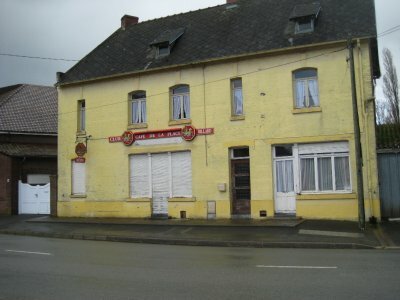 Cigarettes are only sold in small shops called tabacs in France, which also tend to have lottery tickets and a small bar with a small menu of food. The one I pulled into seemed to offer at least some food, as there was a big sign on the windows announcing "SANDWICHES." I walked into a smoky bar area where a number of older French gentlemen were standing around laughing and swapping stories. I walked up to the bar and waited while the bartender finished off an especially amusing anecdote. Once the regulars had been suitably entertained, he wandered over to take my order. "Avez-vous une carte?" I asked, requesting the menu. The bartender looked shocked for a moment, before regaining his composure and shaking his head grimly. "No, ce n'est pas possible," he said, before launching into a flurry of French that I didn't understand. I stood dazed for a moment, and then replied with the only thing I could think of to say. "No?" "No," the bartender said, a shrug in his voice. He then returned to his regulars at the other end of the bar where another hilarious story was in full swing. I stood quietly for a moment, hoping for some reprieve from my hunger, but seeing none coming, ended up having to leave the store quietly, my head down. I returned to Henri, who had been waiting patiently outside. "I bet you would have gotten served," I said. Henri offered me a quiet sympathy, before roaring to life to taking me away from the tabac. I don't know why I couldn't get a sandwich as advertised. Perhaps the kitchen was closed, though it being around one o'clock in the afternoon, I would think it to be prime lunch hour. Perhaps it was just obvious that I was not from around those parts and had a silly accent and not much command of the language, and they just don't serve my kind around there. I don't know. I do hope, however, that at least I become the prime character in one of the hilarious stories that fly around the smoky bar area. I'd hate to be forgotten. 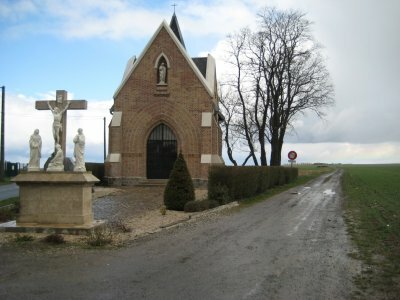 From Thélus, I headed east along the backroads, basically driving towards any steeples in the hope that the town would have something to eat. I didn't have much luck, but did get some nice pictures along the way. In Saily-en-Ostrevent, there was some pretty little houses and businesses. Sadly the pub was closed. 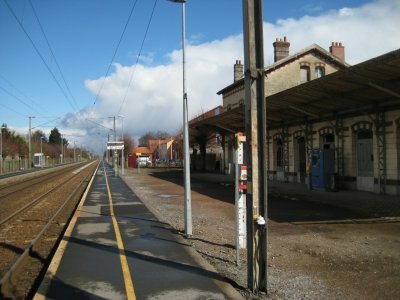 Up the road is Vitry-en-Artois, which had this abandoned looking train station. 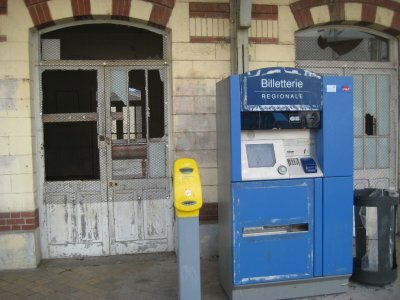 The train still stops here, but you have to buy your tickets using the automated machine. 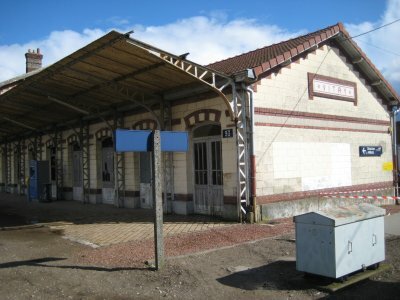 The station building is abandoned. There was a bunch of old guys in really big wellies (rubber boots) gathering outside of this (sadly shut) pub. I don't know if they were farmers, hikers, hunters or grave diggers, but they looked pretty scary. Like the kind of people who would think nothing of killing the foreigner in town and burying his body in a shallow, muddy grave. Needless to say, I didn't linger around too long. 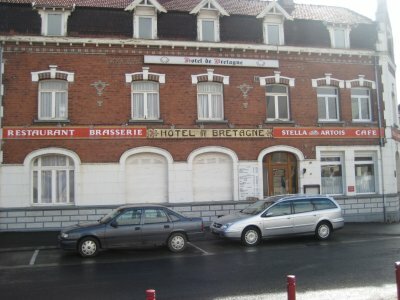 Just down the road, however, I came across my first chance of food in Douai. An Esso Gas station with an automated food machine. I bought a ham and cheese sandwich for €3.50, and immediately regretted it. I didn't open the sandwich, instead putting it on the seat beside me, and continuing my trip. 5 minutes down the road there was a McDonald's. Thank god for the unstoppable spread of American fast-food culture. Douai is an absolutely stunning place with a beautiful medieval centre, including an imposing town hall that was glimmering in the sun. 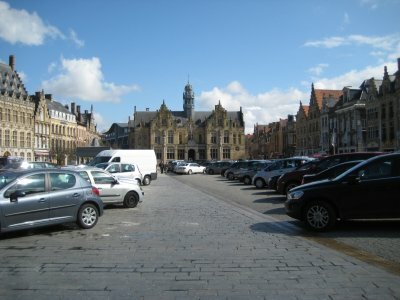 It also has a shockingly large amount of cars looking for a shocking small number of empty parking spaces, so all I could do was circle the town hall three times before heading back out of town. The image of the town hall's spire glistening in the sun is burned into my memory. You'll just have to imagine what it was like, though, because I need two hands to drive Henri and thus didn't have one free to snap a photo. 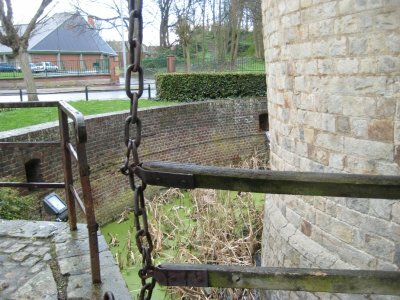 I did get a couple snaps from Douai, though, of this medieval gate. These were easier to get, as the gate was well outside the centre and thus parking was ample and free. From Douai I headed back to Lille, my first days adventure complete. I got back to find that Lille traffic on a 5:30 PM on a Saturday is horrendous. It took me a good 45 minutes to cover the 3 kilometres or so from the motorway back to my hotel. Perhaps, given the ladies of the early afternoon that I saw walking the streets in Lille previously, these were all potentially Johns. Who knows, but I was glad to get back to my hotel room and a nice hot shower. After my shower, I sat down to organize my photos. Feeling a little peckish, I opened up that ham and cheese sandwich. It was like biting into a wet newspaper, though wet newspaper probably has less chance of giving you e-coli. I tossed the sandwich in the bin, and again thanked McDonald's for the Big Mac. I'd hate to think what would have happened if I hadn't found that McDs and would have had to actually eat that ham and cheese. 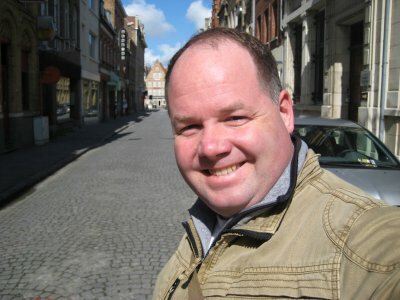 "IT Consultant and travel blogger Greg Wesson was found dead today in a small Renault automobile outside of Douai, France. Mr. Wesson was apparently killed when a ham and cheese sandwich he was eating evolved to the point of being intelligent life, and choked the surprised Canadian. The sandwich, which had spent the previous year and a half languishing in an Esso gas station's automated sandwich machine, stated he was angry about being left in the vending machine for so long. 'Have you ever tried talking to a mozzarella and tomato baguette?' the sandwich asked. 'I mean, sure it is more evolved than the Pringles, but their views on workers rights are, frankly, stone age.' 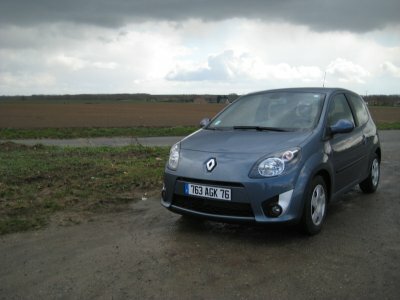 Mr. Wesson's blog will be continued by the people at Renault, who aim to use it to explain to a bewildered public how a Twingo is different than a Clio is different than a Mégane." Sunday, after watching the Australian Grand Prix, I headed out in Henri, thinking to myself that I, driving my Renault, must be much like Alsonso, though in reality probably being more like Piquet Jr. 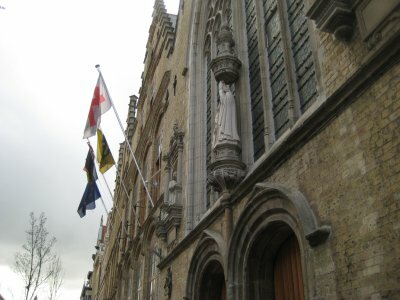 I headed to the North-East this time, following the signs that were taking me to Ypres (Ieper), in Belgium. Traffic signs are bilingual up here, in both French and Dutch, so I get to learn the name of towns in two languages. 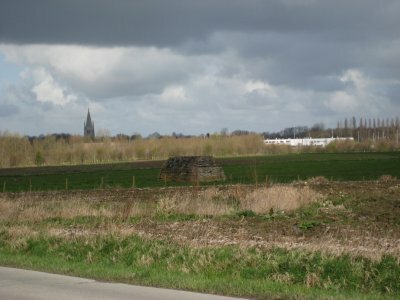 Ypres or Ieper, I am still not sure how to say it. I know that in the Great War, the British soldiers stationed there called it Wipers. 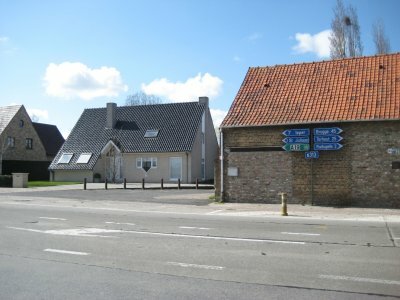 Along the way to Ypres, I went through about 1,000 roundabouts. I am now a huge fan of the roundabout. They are so much more efficient and quicker than stop signs or stop lights, at least at anything up to a moderately busy intersection. For a really busy intersection, traffic lights make the most sense, but below that, the roundabout rules. You pull up, slowing down to check for any cars in the circle. If there are none, you go. If there is one, you stop. Simple, quick, and (so they say) a lot safer than traditional four-way intersections. Less chance of fatal head-on or T-bone crashes. If you are going to hit something, it is probably going to be a glancing blow along the side of the car. The kind of thing that makes body-work guys happy, but won't kill you. Ypres is an old town, and quite pretty. The site of intense fighting during WWI, there were a number of site around the area that I wanted to see, so I used the place as a base for my driving for the rest of the day. I did take some time to wander around the pretty town centre, which has been gloriously restored to its Medieval beauty. 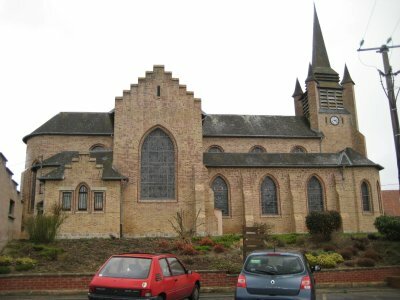 Much like the countryside in France, the country side in Belgium was made up of a lot of fields punctuated by the occasional small town with a tall steeple on their church. 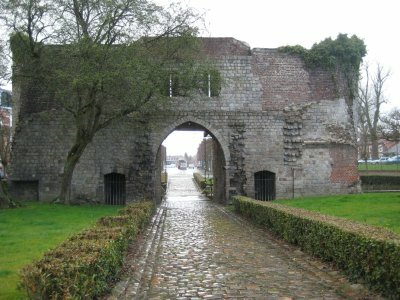 Henri and I did have some drama, as I got lost trying to find my way from Ypres towards St. Julien. Sadly, St. Julien wasn't on any of the maps I had, which is probably due to the fact that the only map I had was of Lille's city centre and thus was unlikely to have a small town in Belgium appear on it. St. Julien doesn't, unlike many towns, appear on the numerous road signs along the way. I did however, somehow find St. Julien eventually. Happiness abounded. 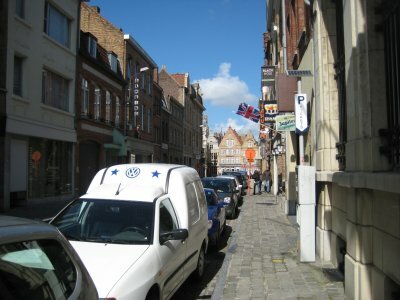 From St. Julien, I was able to make my way back to France and Lille, thanks to the well marked road signs. If only St. Julien had been so well marked. The drive back to Lille gave me one last chance to listen to Virgin radio, drive a car on the right hand side of the road, feel the sun through the windows and keep an eye out for the towers as we crested the small rises. You know, don't tell anyone this, but I've enjoyed some McDonalds in Europe myself. I'm not proud of it, but late at night those fries are hard to resist. It looks like you had a blast!